Whoa, almost totally delayed posting this thanks to problematic internet where I'm visiting family, but I'm back online so please hit this designer sale tonight for a great cause! Apex is a Manhattan-based youth organization providing under served Asian-American youth with valuable mentoring and educational services. The fabulous blogger Dream Sequins has worked hard to make this event happen, so if you're in the city please drop by. For a look at what you can get at the Cutdrop online sale, check out this Dream Sequins post from today. Disclaimer: Technically, yes, this is OPB, but for a good cause I'm down with OPB. And hey, you can get Doo.Ri at Macy's Herald Square 2nd floor. Aeropostale's third annual Teens for Jeans promotion has already begun, and the first 100,000 pairs of jeans donated will be matched by Aeropostale with brand new jeans for the victims of the earthquake in Haiti. How to participate? Until Sunday, February 14th, you can donate your gently worn jeans to any Aeropostale store in the US and Canada. The store, in conjunction with DoSomething.org, will make sure the jeans get to teens in Haiti and one of 600 local youth shelters that have been selected as partners. Those who donate their jeans will receive 25% off a new pair of jeans at Aeropostale. Donors will also be entered to win a pair of signed jeans from Kellan Lutz, Kelly Clarkson, cast members of Glee, Gossip Girl, One Tree Hill, and many more of today's young stars. So bring your jeans by you local Aeropostale today, because in addition to helping out the teens in Haiti, Teens for Jeans assists homeless teens in our communities, and raises awareness about this homeless epidemic. Last year over 200,000 pairs of jeans were donated. 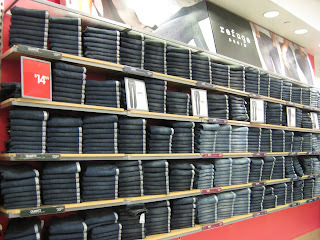 For more information on how students can get more involved with Teens for Jeans, go to teensforjeans.com. Another week, another weekly Wednesday guest post, this time with coworker Katie, who visited the recently rebranded Ann Taylor Loft, now known as LOFT. LOFT on 34th Street has a huge sale section at the back of the store and right now all sale items are an additional 50% off! 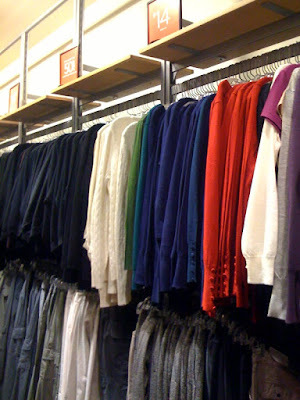 The promotion is for a limited time only (though none of the salespeople were able to tell me when it would end) so go now for the cardigans, chunky knit sweaters, long sleeve tees in a variety of colors, lots of pants, skirts, and sweater dresses to spruce up your winter wardrobe. 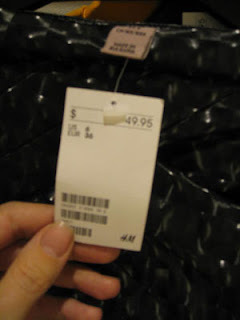 I'm still lusting after this black jacket, originally $89.50, on sale for $49.99, and now a whopping $24.99 with the extra 50% reduction. Although I already own too much black, it would be the perfect throw-on-to-look-effortlessly-put-together piece. 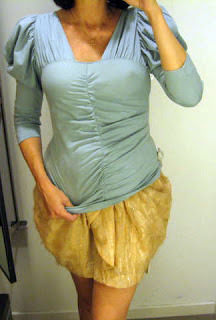 I love the three quarter sleeves and the nice balance between structure and frill. 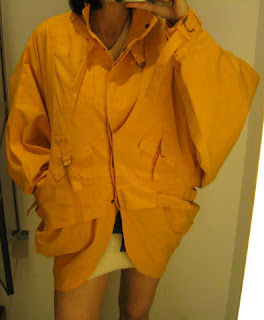 Alas, I decided there was no point in buying the jacket, regardless of the incredibly tempting sale price, if I couldn't actually move my arms while wearing it. [Insert sad face here.] If you're petite you may be in luck. 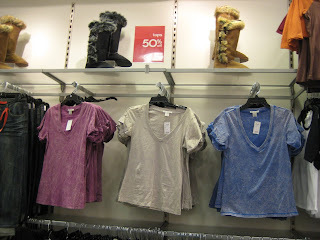 I saw a lot more petite sizes left on the rack than regulars. Go cruising at Old Navy on 34th Street this weekend and pick up some new gear for the high seas. Or, for you land lovers, buy some regular old resort wear. Either way, if you're a cardholder (Old Navy, Gap, or Banana Republic) you get 25% off your entire purchase all four days you shop Old Navy from Thursday, 1/28 through Friday, 1/21. And if you don't have a card, sign up for one and you'll get 25% off all four days too. Baby socks aren't exactly cruise wear, but socks fall off Arm Baby like she's a greased pig. I find little socks lying round everywhere. 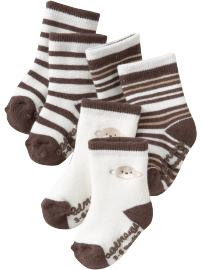 These Old Navy baby socks are the only ones that stay on her feet, and they are striped, so they are all she wears. Old Navy 34th Street will also have some cruise-inspired fun during the event this weekend, including music, dancing, karaoke, games, prizes, fashion shows, and some travel representatives hanging out ready to sign you up for the QMII world cruise. Well, I don't know if the QMII people will be there, but if the stars were aligned, she'd be my cruise of choice, thanks. How many times can I say "moisturize" in this post? A lot, thanks to the Bare Escentuals* RareMinerals Purely Nourishing Duo. Find it at the boutique on 34th Street. This is pretty much what I've always wanted in a cleanser: an accompanying moisturizer right in the box so I don't have to think about moisturizer. I can waste a lot of time staring at all the moisturizing options at the drugstore. But with this new BareEscentuals deal the Renew & Reveal Facial Cleanser and the Purely Nourishing Facial Moisturizer come in the same box. This is important because lately I've been staring at all my moisturizing options in my bathroom cabinet and then walking away, yes, horrors, without moisturizing! I'm that lazy thanks to months of sleep deprivation. And I've got too many tubes of moisturizer lying around. It's annoying. So now that we all hate the word "moisturize," go buy this duo so you don't have to think about moisturizing ever again. Desigual's future location on 34th Street. The only Bakers Shoes in Manhattan, on 34th Street, has closed down and is moving. Luckily, they are staying on the same 34th Street block between 5th & 6th. They should be opening the end of this month and just in time for a little Fashion Week shoe buying. Desigual is moving into the old Bakers space. And don't forget, there's a new Aeropostale in the old Aldo space, Aldo has moved down the street next to the new Geox store, and Korean retailer Who.A.U. will be moving into the old Kira Plastinina space. Phew. Just consider all this activity on 34th Street between 5th & 6th as a harbinger of activity to come on 34th between 7th & 8th, as there is a lot of retail space opening up there soon. Yes, in the past I have chanted with the Swami for a Topshop in the 34th Street district, but there are several other possibilities I'd love to conjure up as well. Let the retail dreaming begin. Update: And how could I forget Esprit moving into 21-25 W. 34th?! And the available space in the old Shoe Mania space at 11 W. 34th? 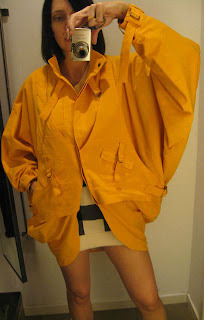 Obviously I'm a Patrick Starfish addict, because I love this yellow coat ($99). 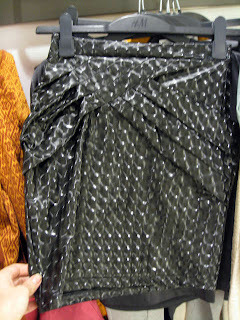 Grey legging-jodhpur, $29.95, gold shiny skirt up-close, $34.95. 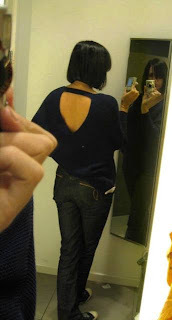 Pretty blue sweater with a really good back, $49.95. 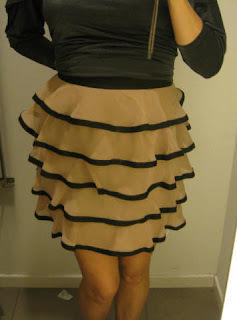 Tiered skirt good for anyone but me, $39.95, check sweater dress, $79.95. 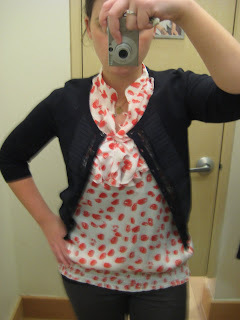 Next up in our weekly Wednesday staff guest posts: Catherine, who perused Banana Republic on 34th Street. Exciting news item #1: Banana Republic is having a sale on sale items. 40% off sale prices! 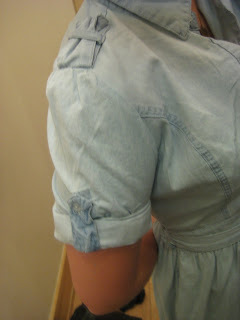 Exciting news item #2: They're going crazy with denim. If you're looking for a new pair of spring jeans, stop by. 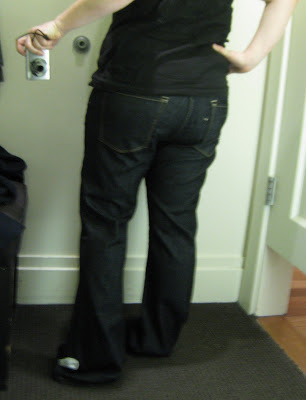 I'd never tried their jeans, and I was pleasantly surprised. Boot-cut, trouser fit, straight leg, boyfriend, skinny, super-duper "are those jeans or did you paint your legs blue" skinny, slouchy...the list goes on, and in all sorts of washes. As we've already established, my height makes it difficult to see how the different leg openings will look in real life (post-hem), so use your imagination. 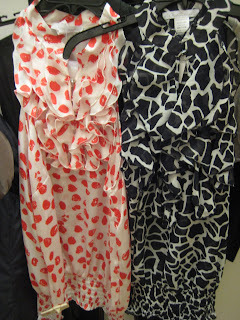 Sidenote to shorties: In addition to Petites, BR sells "short" (and "tall") sizes online. 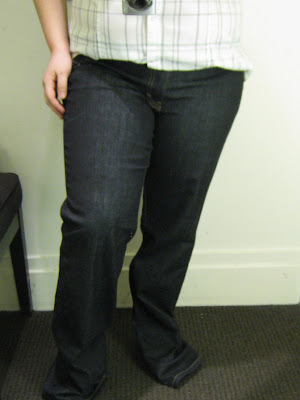 These are the low-rise boot cut jeans in a dark wash. I wasn't crazy about them from the front, but helloooo backside! I like this view. 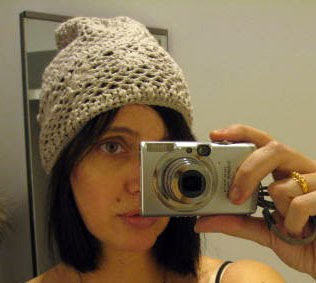 For this next lovely item, I'm enlisting the help of a website model. Oh, Banana Republic, I love your button-down tops, but how about a little accommodation for your well-endowed female clientele? 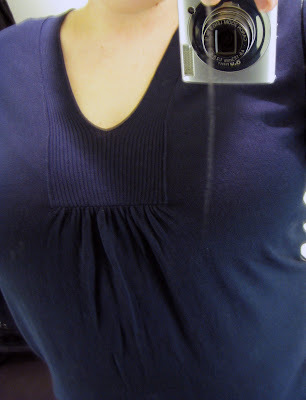 They fit everywhere except for the bust, where I have a lovely 1-inch gap. 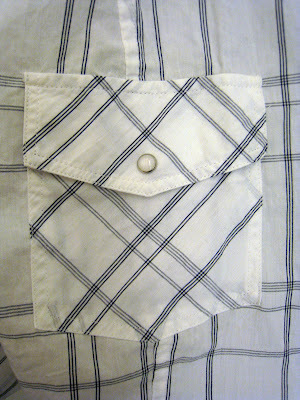 Anyway, I like the pearly buttons, and it'd be great with a navy cardigan. 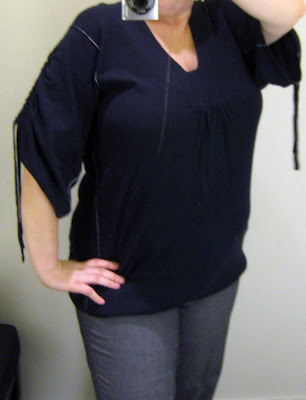 And for a work look, I tried a (get ready for the dreaded "c" word, Tricia) comfortable cotton sweater top in navy. It has white piping on the seams, drawstrings on the arms, and a nice neckline. 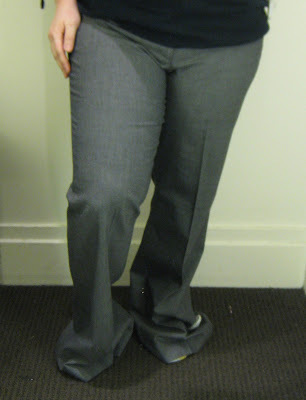 I always check Banana Republic when I'm searching for work wear because I love their pants. Classic cuts and colors with good, simple details. These are 323 Martin flared pants in a very neutral navy. 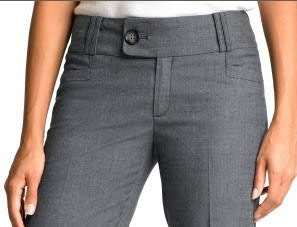 These feature a wide waist band that (imagine Stacy London's voice) "lock & load" the tummy. Visit the Soiffer Haskin Mikimoto sale today until 6:30pm, and tomorrow from 9am-4pm. 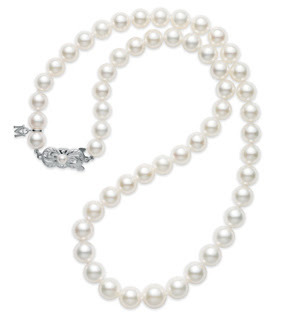 This sale features "exceptional savings" on South Sea and Akoya cultured pearl strands, and an "expanded offering of pearl jewelry embellished with diamonds and other precious gemstones." I'd go just to ogle the strands, but for those of you looking for an unforgettable pearl-something for your future graduate, this may be the perfect sale. The Cole Haan sale at Soiffer Haskin starts this weekend. Go here for more information. I went last year with my sister who stocked up on work shoes and bags. I was tempted by a "diaper bag" (not really a diaper bag, but the saleswoman was good) and great flats. This sale is flat heaven. 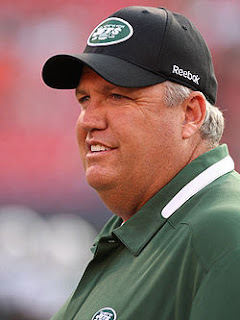 Fashion Herald hearts Rex Ryan. Because the Jets have advanced yet further in the playoffs (thanks, of course, to Arm Baby wearing her lucky Jets onesie on game day), I must remind you again to buy your Jets gear on 34th Street. Go to Cosby Sporting Goods, Foot Locker, and Modell's, and get on the Jets, train, people, because Rex says we're going all the way. And, like Lipstick in the Mailbox, we love Jets green! Charity Navigator list of ten charities to donate to for Haitian relief. 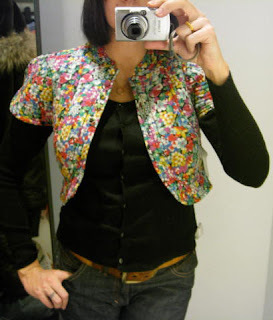 Get your Dynasty garden party on with this fabulous cropped jacket, $59.95. Peach shirt $39.95*. Dress, $59.95, blue top is $34.95, more on that gold skirt tomorrow. I thought the blue might work with the skirt but not really...better for a more petite girl. Cream zip up top (I really wanted to buy this), $34.95, and black skirt, $39.95. 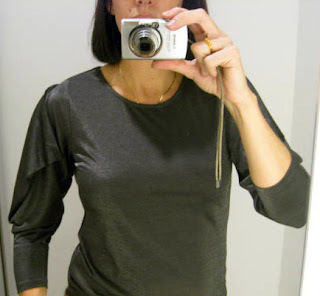 Casual grey shoulders, forgot the price! 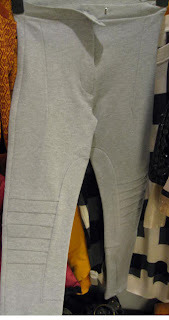 Tomorrow it's khaki safari casual H&M, which has some interesting coats and irresistible striped leggings. *re: my styling, let's just say I was walking and grabbing clothes! First in our weekly Wednesday staff guest posts! Please welcome Kati today as she explores Charlotte Russe in Manhattan Mall. I haven’t been to Charlotte Russe since I used to shop there for hot tops as a fifteen year old. 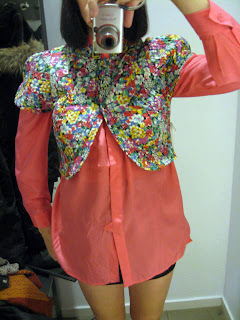 Good for a wear-it-once-and-get-tired-of-it blouse here and there, I didn’t think very highly of the store back then. So it was with some strong prejudices that I stopped by the Manhattan Mall location last night, on special assignment from Fashion Herald. First impression: I almost fell over in shock when 3 store associates welcomed me with genuine smiles and greetings. The store was cleaner than I expected, and even more well organized (an area where other discount stores often fall short). 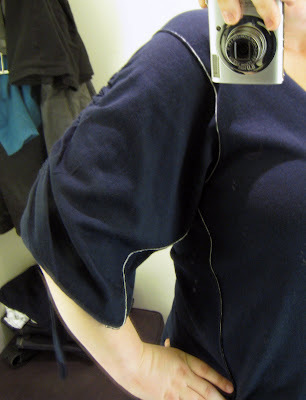 Still nervous about trying on teenage hot tops, I set out to find some more respectable pieces. They had several different printed ruffled shirts, paired with detailed sweaters. The halter tops I tried hung strangely at the bottom; a problem that might have been resolved with a smaller size. 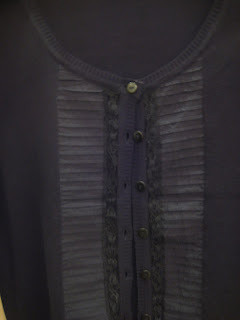 However, I really liked the lacey inset detail on the black sweater. 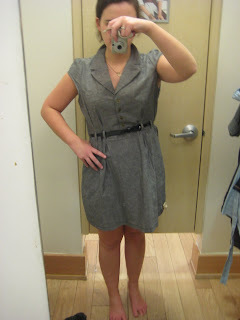 I tried a couple of dresses, but could hardly focus on the clothes when I realized this was the dreaded annual event –the Spring Reveal of my long lost bare legs after months tucked under layers. 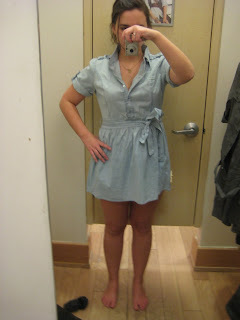 After adjusting to the blinding white light coming from my legs, I saw the way cute Oxford-style Shirt dress I had on. Thinking I’d love to wear this on the Fourth of July, I almost bought this for only $26.99! Then I remembered that is 6 MONTHS away. I also liked the more structured dress, and could see it adapting to different seasons with the right accessories. They have an entire wall devoted to denim, so I tried a pair of denim leggings. And was shocked… I loved them! They were only $29.99 and could not have been more comfortable. The soft acid-washed tees are 50% off of $8.99 right now. 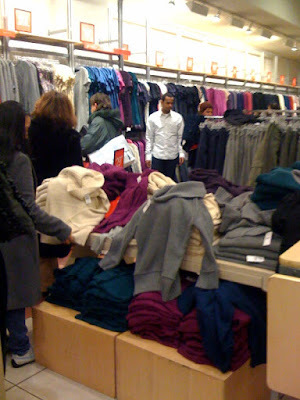 Which is about 80% less than I pay for similarly distressed V-Neck Tee shirts at another retailer (American Apparel).